Police were called to the incident at 3.30pm yesterday. Police have increased their patrols in Harrogate today, following a serious assault in Valley Gardens which saw two teenage boys being taken to hospital. A North Yorkshire Police spokesperson confirmed: "You might see more police officers in Harrogate today. Extra patrols are in place to reassure residents, and we're continuing to investigate the incident in Valley Gardens yesterday." Two teenage boys, both from the Leeds area, have been arrested following the assault yesterday, and they remain in custody at this time. The two injured teenagers are in a stable condition in hospital. 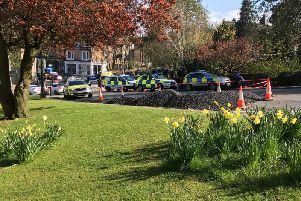 There are still unconfirmed reports that this may have been a stabbing incident - but North Yorkshire Police said they will not provide any further information at this stage, other than the fact that it was an assault.